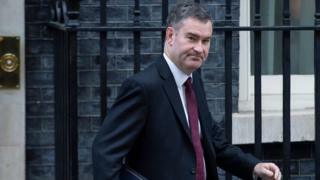 Justice Secretary David Gauke has become the second cabinet minister to suggest Parliament could be given free votes on some Brexit-related issues. He told the BBC MPs should be able to vote according to their personal views when the next Brexit motion is debated on Tuesday, "to resolve things". Mr Gauke also reiterated he would consider his position if the government opted for a no deal EU withdrawal. Work and Pensions Secretary Amber Rudd has adopted a similar stance. She told the BBC this week that she is "committed to making sure we avoid" a no deal Brexit and would not rule out resigning over it. But she said allowing a free vote could help establish what Brexit solution could command a majority among MPs. Speaking on BBC Radio 4's Any Questions, Mr Gauke - who like Ms Rudd backed Remain in the referendum - warned that the way the UK leaves the EU should not be "railroaded through" without Parliament giving consent. Asked whether he backed MPs being given a free vote - even if it potentially led to an extension of Article 50 - Mr Gauke said: "I think there is a case for free votes in this area to resolve things. "As far as Tuesday is concerned... we need to see what all the amendments are going to be, to see whether Tuesday is a crunch point or not." On Tuesday, the House of Commons will see MPs vote on Mrs May's next steps for Brexit. Some groups of MPs have also tabled amendments to her motion to try and change the course of Brexit - including attempts to stop a no-deal Brexit and to extend the deadline for leaving the EU. Could EU offer an extra 'couple of weeks'? Meanwhile, Ireland's minister for European affairs Helen McEntee has said Ireland is not "trying to be awkward" in the row over the controversial backstop in the Brexit deal. The backstop is a last resort measure to ensure an open border between the Republic of Ireland and Northern Ireland. It would only be used if the UK and EU cannot agree a permanent trade deal by the time the Brexit transition period finishes at the end of 2020. Speaking to BBC Radio 4's Today programme, Ms McEntee said Mrs May's red lines on Brexit have made a backstop "absolutely necessary". She explained: "The UK have said we're leaving the single market, we're leaving the customs union, and for us that makes it more difficult to avoid a border." The minister added: "The onus by the UK has been shifted back on Ireland that we should compromise, that we are the ones that are trying to be awkward or difficult. "We did not vote for Brexit. We don't believe in it. "But we are protecting a peace process. There is an obligation on the UK to ensure the Good Friday Agreement is protected." Theresa May is continuing to seek support for her Brexit deal ahead of a crucial Commons vote on Tuesday. On 15 January, the withdrawal deal she negotiated with the EU was rejected by MPs by a historic margin - 432 votes to 202. Tuesday's vote will see MPs debate and vote on her next steps for Brexit. Opposition and backbench MPs have been tabling amendments to her motion in a bid to force the government to change direction. These include attempts to stop a no deal Brexit and to extend the deadline for leaving the EU. On Friday, Commons Leader Andrea Leadsom said cabinet ministers should back the prime minister's stance of leaving the option of a no deal on the table. She also suggested the EU may be prepared to grant the UK a "couple of extra weeks" beyond the 29 March deadline to finalise preparations for Brexit. However, Ms Leadsom said she had "grave concerns" about a bill, proposed by Labour MP Yvette Cooper, which could extend Article 50 - which triggers the UK's withdrawal from the EU - by nine months. Mr Gauke agreed with a suggestion that leaving without a deal could be "pretty disastrous" for the UK, saying it would have a "significant impact" on jobs. He said: "If there is a conscious choice, 'Right, that's it, we're going no deal', that would be something I would find extremely difficult."